Born in 1753, Edmund Randolph was 57 when he wrote this letter asking for medical advice from Dr. Joshua Birch in New York for what sounds like the aftermath of a stroke. 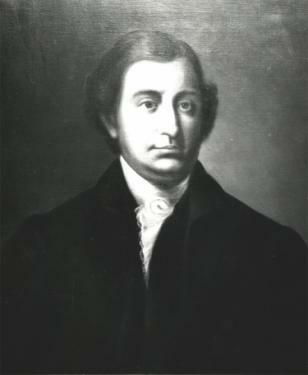 He served as a governor to Virgina, and under President George Washington was the first U.S. Attorney General and the second Secretary of State. He was one of the defense attorneys for the treason trial of Aaron Burr. He died a little less than three years after writing this letter about his various afflictions after a sudden and unexpected episode. Letters of Edmund Randolph, 1810, Accession #9112, Special Collections, University of Virginia Library. Yesterday I accidentally met with Mr. Stanley, a gentleman of New York, who perceiving that I was lame on my left side, and learning that I had been struck with a hemiplegia, informed me, that you had manisfested your skill in the medical profession by a remarkable cure, which you had lately performed on a Doctor Grase of Surinam, and permitted me to mention his name should I write to you on the subject. Now the success of physicians in this country with respect to this disorder has been so rare, so scanty and so equivocal, that I must trouble you with a request for your advice, specifically, where my narrative will permit it, or generally, if you should think it more advisable to give it in that form. Without any warning, I was struck on the 9th of April last, no pain succeeded for some days, and then only a hiccup at every expiration and inspiration for three days. I think, from a fulness of diet, in which I had indulged myself for a week before, that something of a plethora must have concurred as a cause; and the depletions, and various other modes of reducing me lead me to suppose this to have been the opinion of my physicians. However this may be, I have passed thro’ the ordeal of medical experiments, which always abound in such a case, the real principles of which are so imperfectly understood. I went to the Warm Springs in Virginia in August last, where I found, that the strongest of their reputed affects had taken place in rheumatisms, which had been misapprehended for paralyses. … Diet, exercise and air are attended to. But if it were possible to obtain some ointment, which might lubricate the stiff muscles, I would willingly make the attempt under the auspices of a regular physician. I am fifty seven years of age. Your early answer for the whole case will much oblige me, and I will forward you your fee, upon being notified of it.